Something may be happening in Beijing. The question is what that might be. Australian Treasurer Scott Morrison has cancelled a trip to Beijing this week after China made a last-minute decision to postpone a meeting between the two countries' top economic officials. The Strategic Economic Dialogue, which was to have been attended by Mr Morrison and Trade Minister Steve Ciobo, was postponed by Chinese officials late on Friday. A spokesman for Mr Ciobo said the delay was "because of unanticipated leadership meetings within China". It’s rare to have a high-level meeting with China cancelled, unless the reason is related to the state of ties between particular countries, and then the usual statement from Beijing is that it’s “currently not convenient” [合适 is usually one component of any such statement in diplomatic parlance here]. But it’s almost always the case that a meeting that was scheduled to be announced to take place goes awry because someone did something that the Chinese leadership took offense to. There’s no direct indication of that having happened here, because Chinese spokespersons usually say something about precisely what their superiors are annoyed about. They didn’t, apparently. What may have occurred is that Chinese diplomats told their Australian counterparts in confidence why such a high-level meeting had been cancelled, and that officials in Canberra, eager to not set off alarm bells concerning the state of relations between China and Australia, chose to pass on what they were told. What they were told is that something’s come up that wasn’t scheduled, and changes have to be made. Which is strange, because all leadership meetings in China are "anticipated". So is there something happening that's worth paying close attention to? Perhaps there is. It’s almost impossible to know, beyond taking Chinese officials at their word--which isn’t a bad thing to do, though there are some observers of politics here who seem to believe that while China Daily represents leadership thinking, parsing the Party media is somehow a silly exercise. Assuming then that there are “unanticipated leadership meetings”, something important and at least somewhat unexpected has either happened in very recent days or is about to occur. The scenarios are almost endless. There could be a change coming among China’s financial leadership, perhaps in the Ministry of Finance. The recently appointed head, Xiao Jie [肖捷] has taken a very low-profile in his job, so much so that it’s been relatively rare to see his name mentioned, leading to rumors about his health and political status. It would be enormously difficult to make progress on China-Australia ties on investment matters, for example, if there was a question about who held authority to conclude an agreement. It may be that there is a major shakeup in the leadership to be announced, and that it involves members of the Politburo. Perhaps someone has decided to step down, or is being forced to do so (possibly because of corruption). 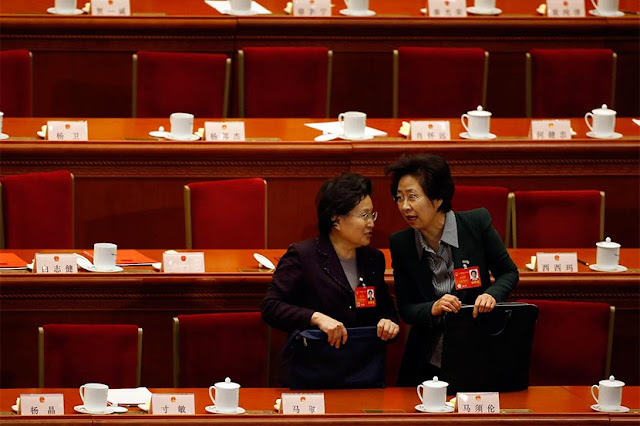 It could be that either of China’s retired leaders—Jiang Zemin or Hu Jintao—has suddenly taken gravely ill. That development would require the attention of the Chinese leadership on very short notice. And there’s also the outside possibility that there’s been a direct challenge to the present political leadership that needs to be confronted—that an emergency conclave is called for, and that’s what the “unanticipated leadership meetings” refers to. Beyond the explanation from Beijing, this is all speculation, of course—not prediction, or even an assessment of probability across the scenarios mentioned above. The fact is, no one outside China’s inner circles can possibly be certain that the reason for a postponement is political, be it because of health or something potentially more sinister. Unfortunately, there are plenty of people, especially in Beijing, who have zero access to and even less understanding of politics here who will be eager, as before, to run with rumors about Chinese leaders, and it behooves all to be wary. In Chinese politics, the mundane matters, and often it's the mundane that matters more. At the same time, the explanation that’s been given for a postponement of what were to be important talks is noteworthy, assuming it's accurate. Something may be happening here, even when something else isn’t going to be.